It is our great pleasure to announce the opening of Hoppe Singapore office, a wholly owned subsidiary of Hoppe Group, HQ in Hamburg, Germany. 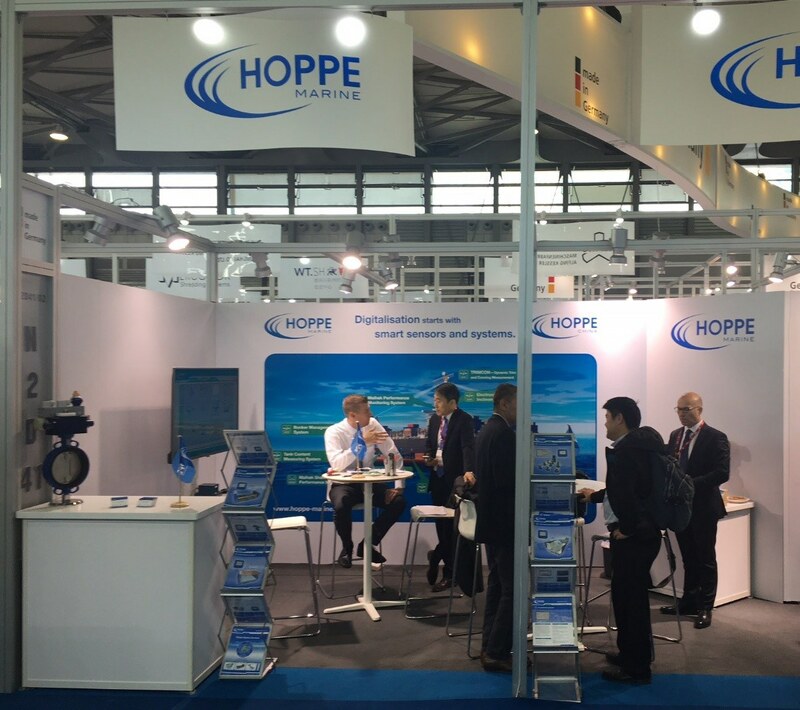 Hoppe Singapore set up adds to the already existing network of Hoppe Marine in China and South Korea further strengthening Hoppe’s commitment in ensuring a reliable and timely response on service and spares support to customers in the region. Hoppe Singapore is headed by Dr Wilfred Rachan as Managing Director with his team of Service Engineers and Administration staff. 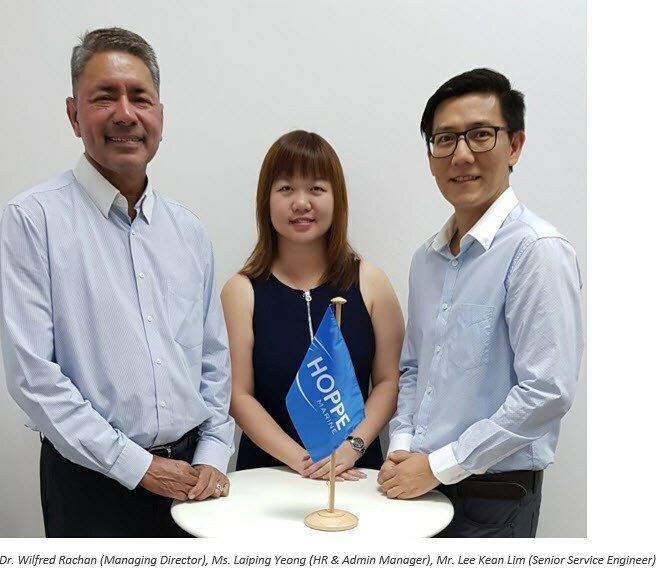 In addition to its role as a Sales and Services office, Hoppe Singapore shall also be the spares and logistics hub for Hoppe Marine operations in the region. During the current challenging maritime market, Hoppe Singapore’s goal is to provide quality services and spares efficiently and economically to ship owners and operators in the region. This investment in Singapore is a reflection of Hoppe Marine’s commitment to the customers that Hoppe is here to stay for the long term. Hoppe Singapore is positioned to provide sales and services support to Ship Design Offices, Shipyards, Ship owners and ship operators. Local presence of qualified and trained service engineers coupled with local availability of quality spare parts and tools are key to ensure competency in service delivery to our customers in the region. Please do not hesitate to contact us, we would feel much obliged to be of service to you. Launched for over 30 years, Marintec China has become renowned as the most authoritative B2B platform for the International Maritime Industry. 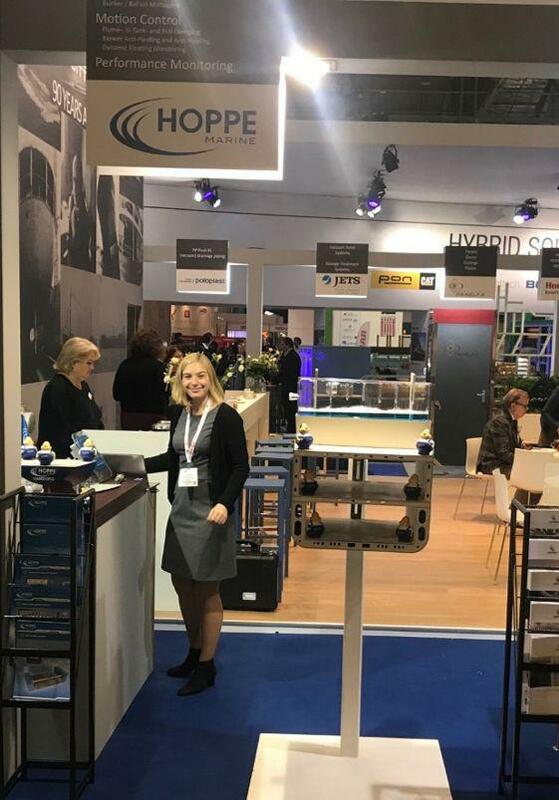 As in previous editions of this biennial event Hoppe was delighted to welcome many visitors across the complete maritime range during 5-8 December 2017. Our booth personnel on this important event represented staff from all Hoppe locations worldwide. We had the opportunity to discuss current projects as well as the market development and outlook with our customers and partners. It was generally agreed that the preceding business year seemed to turn out well and that this positive trend will continue in 2018. The most addressed topics were the HOPPE Marine Tank Content Measuring System which continuously monitors the contents and temperatures of ballast, cargo, fuel oil, and other liquid tanks, our Valve Remote Control System, designed for remote control of pneumatic, hydraulic or electro-hydraulic operated valves and our newly developed Electronic Inclinometer which displays actual roll and pitch data in real time according to IMO res. MSC.363(92). Summarizing, we can say that the event was a great success and we are looking forward to continuing a prosperous business in China. During 7th to 10th November 2017 one of the world’s leading exhibitions for maritime technology, Europort was held. Europort has a strong focus on special purpose ships including offshore vessels, dredging vessels, construction vessels, naval vessels, workboats, inland vessels, fishery vessels and super yachts. Our German colleagues Ms. Dorothee Gaedeke (Sales Manager) and Mr. Joern Rohde (Senior Customer Relation Manager) welcomed many existing and potential customers on the booth of our sales ambassador TBU (BV Technisch Bureau Uittenbogaart). Besides the HOPPE Sensor Toolbox HOSET 2.0 which is an essential maintenance tool for any ship’s crew for checking, calibrating and exchanging of tank sensors independently, a main topic had been our very accurate and reliable MAIHAK shaft power meter using the Maihak vibrating string sensor. Another principal topic was our unique Flume® Stabilization System which helps reducing roll motion of ships by up to 60 %. Hoppe Marine participated in one of the leading South Asia`s Maritime Exhibitions: Inmex SMM India in Mumbai last week. We as well as our local Sales ambassador Navicom were delighted to advertise and demonstrate our solutions to interested visitors. The biggest fields of interest were our unique Flume® Stabilization System which helps reducing roll motion of ships by up to 90 % and our newly developed Electronic Inclinometer which displays actual roll and pitch data in real time according to IMO res. MSC.363(92). Many visitors represented the Navy, for which we developed various sophisticated systems and solutions in the past years. The validation of data quality and measuring accuracy of related systems and sensors is a mandatory prerequisite for any meaningful data analysis with resulting product development and steady quality improvements. Therefore the standardised Validation Catalogue is executed preceding each system or ship operations analysis that is performed by Hoppe Marine. 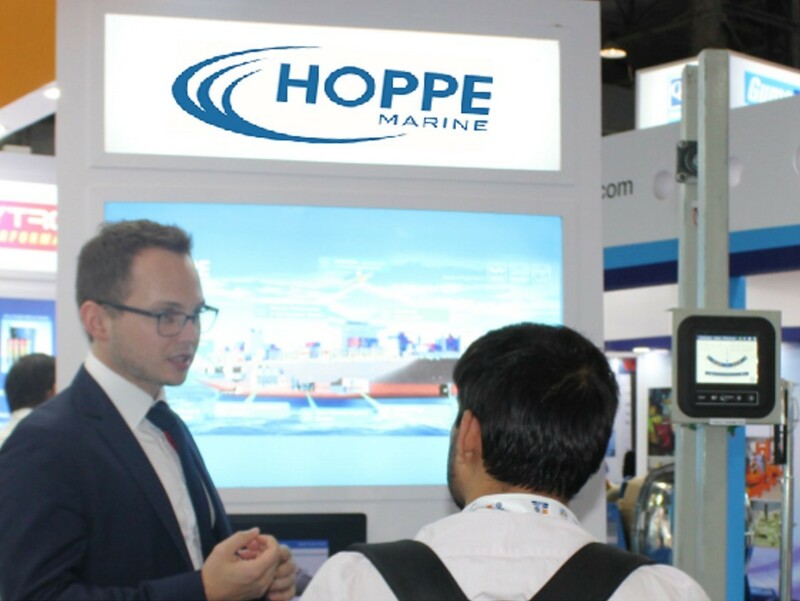 As a manufacturer and redistributor of high precision measuring equipment and systems for the maritime industry and service provider for standardized and individual data solutions, Hoppe Marine combines unique know-how in the industry. The data quality section of the Validation Catalogue focuses on data loss, signal mapping, scaling factors and systematic deviations. Implausible value ranges are automatically detected and highlighted. A proactive approach and close cooperation with the service and software department, as well as our customers, guarantees fast detection and correction of causes of error. The measuring accuracy section of the Validation Catalogue focuses on plausibility and deviation of the measurements of related systems and sensors. Hoppe Marine’s own measuring equipment, like the MAIHAK Performance Meter and flow meters, can hereby be analysed to the very last detail. This enables us to locate the exact source of error in advance, streamlining service operations and saving time and money for our customers. In addition third party equipment, such as speed logs and wind sensors, can be validated to ensure correct functionality. Knowledge gained from data analysis is also used to develop and improve our hardware and software solutions. For example in 2016 an algorithm was introduced to the MAIHAK Performance Meter software to self-identify zero point drifts and prompt the crew to perform a calibration accordingly. Calibration procedures are logged and can be accessed retrospectively, allowing to prove the proper functioning and accuracy of measuring equipment, for example to comply with standards such as ISO 50001. The Validation Catalogue by Hoppe Marine is the base for all other standardized data solution products such as the Analysis Catalogue, Fleet and Voyage Comparisons and individually customized analyses. It ensures the highest standards of data quality and measuring accuracy and thereby allows to focus on content-related analysis. The above figure Torque at Standstill is used to validate the zero point offset of a MAIHAK Performance Meter’s torque measurement at standstill. It is based on the hypothesis that even though tidal and river currents can induce some torque into the shaft during standstill, on average the measured torque should be zero for a representative data set. 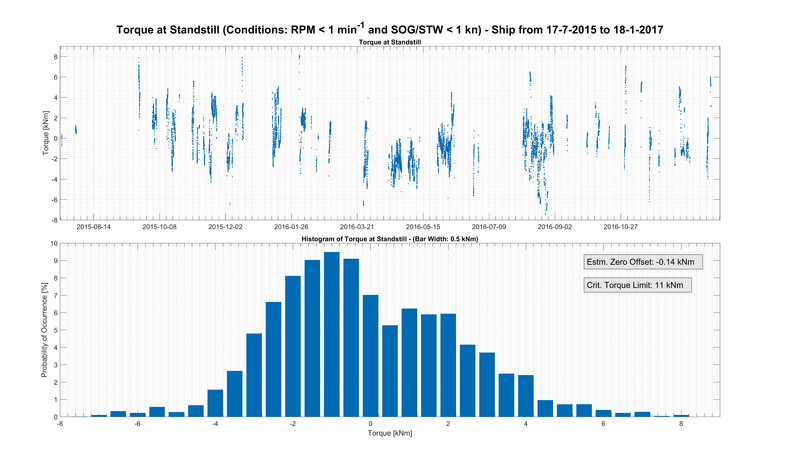 The first subplot displays the torque during standstill over time. It can visualize zero point shifts over time or special events such as maintenance or recalibration of the sensors. The second subplot displays the same data as a histogram to highlight the distribution of the deviation from zero. In the above case the sensors show optimal behaviour with an average zero offset of only -0.14 kNm and all deviations being well within the ship specific limits of 11 kNm. Additionally no zero point shift over time can be seen. The conclusion is that the data can be trusted and used for further data analysis. The hardware is in good order and no recalibration or maintenance is required. We would like to express our sincere thanks and appreciation to all visitors on our booth during South Korea’s Maritime Exhibition KORMARINE 2017. The 20th edition of KORMARINE was held during 24th - 27th October and successfully closed thanks to many interesting and fruitful discussions with existing and potential customers. Main topics had been HOPPE Marine Valve Remote Control System, designed for remote control of pneumatic, hydraulic or electro-hydraulic operated valves, our very accurate and reliable MAIHAK shaft power meter using the Maihak vibrating string sensor as well as our unique Flume® Stabilization System which helps reducing roll motion of ships by up to 60 %. Our local staff from Hoppe Korea, supported by their German colleague Mr. Carsten Rüpcke, advertised and demonstrated our solutions to interested visitors who represented shipyards as well as shipping companies. After careful consideration Rolls-Royce Marine Deutschland GmbH has sold its Intering business to Hoppe Marine GmbH, Hamburg. The trade and asset sale is part of Rolls-Royce’s ongoing commitment to concentrate on areas of its core business. The transfer becomes effective on 8 May 2017. From then on Hoppe Marine takes over new building projects as well as related service and spares activities on a successive basis. The sale includes U-Tank-Systems for roll damping, Blower Anti-Heeling Systems on seagoing ships, as stand-alone or combined solution, and furthermore pump-based Anti-Heeling Systems, also providing an automatized in-service-inclining-test option. With this acquisition, Hoppe Marine now offers the world’s broadest expertise in tailormade, optimized solutions for anti-heeling and passive roll damping systems, under the well established brands Intering, Flume and Hoppe. Hoppe Marine GmbH is a family owned leading supplier of marine systems with main seat in Hamburg / Germany. Hoppe Marine offers innovative and reliable products and system solutions for ships and other maritime applications in the competence areas “Fluid Management”, ”Motion Control” and ”Ship Performance”. During the past years approximately every eight new built seagoing vessel is sailing with Hoppe products on board. Hoppe Marine maintains a world wide service network. Hoppe employs world wide about 150 well qualified staff, in the Hamburg headquarter as well as in its own affiliates in Korea, Chinas and Poland. Rolls-Royce has a world-leading range of capabilities in the marine market, encompassing vessel design, the integration of complex systems and the supply and support of power and propulsion equipment. We are leaders in mission-critical systems for offshore oil and gas rigs, offshore, merchant and naval vessels. ISO 19030 outlines general principles for the measurement of changes in hull and propeller performance and defines a set of performance indicators for hull and propeller maintenance, repair and retrofit activities. 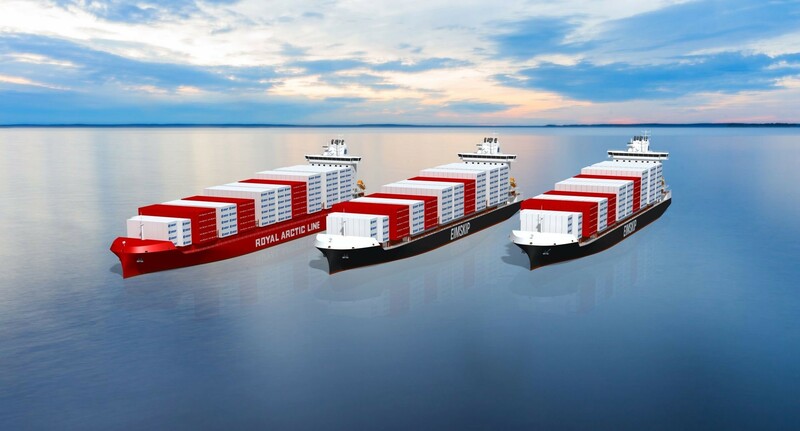 The three recently ordered 2150 TEU Container vessel newbuilding, designed by Deltamarin Ltd are optimized to operate in the harsh ocean environment of the north Atlantic. In this area you never can expect a calm sea and the risk for ships to come in bad weather situations is high. The seakeeping performance of these vessels is therefore under a special concern in the design, why each of these vessels will be equipped with two FLUME® roll damping tanks. These tanks are designed to fit into the ship structure without any loss of container storage capacity. The tank design will be exactly aligned with the ships loading scenarios and the internal structure of the tank will be optimized using most modern CFD tools. For the final performance evaluation, Hoppe Marine uses a 6 DOF moving platform, capable to simulate any ship motion and measure the tanks performance of that particular scenario. Hoppe Marine with headquarters in Hamburg and affiliates in Busan (Hoppe Korea) and Shanghai (Hoppe China) supplied almost every tenth new vessel > 1.000 GT built in 2013 worldwide with it’s quality marine systems. The largest share is with Fluid Management Systems, predominantly Valve Remote Control and Tank Content Measuring, closely followed by Motion Control Systems such as Anti-Heeling- and passive Roll Damping-Systems. Many of the orders were for Container Vessels (among them also Ultra Large CV) and Offshore Vessels, but Hoppe contracted also for RoRo- and Passenger Vessels, Bulk carriers and Tankers. Additionally to the supply for newbuildings Hoppe Marine has retrofitted several vessels in 2013 with MAIHAK Shaft Power Meters and Performance Monitoring Systems as well as with FLUME Anti-Rolling Tanks. To monitor consistent ship performance KPIs or to prove the impact of optimization measures like trimming or new bow or propeller shapes appears often like searching for a pin in a hay stack, since aggregated errors from the data recording as well as the lack of possibility to record and analyze the impact of all involved parameters may lead to standard deviations larger than the expected optimization impact. This is why Hoppe Marine is developing and testing a comprehensive data logging and analysis system under real sailing conditions around it’s quality measuring systems MAIHAK Shaft Power Meter, Hoppe Tank Content Systems and Mass Flow Meters, Hoppe HOSIM Dynamic Floating and Inertial Ship Motion Measuring System and TRIMCON Dynamic Trim Measurement. Core of the System is an onboard data logging system with intelligent algorithms to pre-process continuous input from Hoppe’s and external measuring devices, which can also deliver data to overarching shore transmission and fleet management systems (e.g. Interschalt BLUE TRACKER). Since September 2011 first elements of the MAIHAK Ship Performance Monitoring Systems in different versions and depth are successfully in on board operation (including top operators like Bernhard Schulte and HAPAG Lloyd). In spring 2014 another large operator has decided after a trial period to install a first MAIHAK Ship Performance Monitoring System level on dozens of his fleet’s vessels, in combination with BLUE TRACKER. Hoppe’s MAIHAK Ship Performance Monitoring System provides the key function of logging, managing and understanding data on board, without which every fleet management program would still search the pin in the hay stack. Hoppe Marine has gained valuable feedback from some Container Vessels equipped with the FLUME® Stabilization System during their passage through the Bay of Biscay in heavy winter storms early 2014. On a 8700 TEU- Vessel the data Logging equipment installed with the FLUME® tank recorded 5-6 degree significant roll angles with maximum peaks up to 10 degrees during the worst hours, while a vessel of similar size and load condition without FLUME tank, which followed some miles back on same course reported mean values of estimated 15-20 degrees. This was impressive evidence how FLUME® passive roll damping Systems can contribute to a safer passage for crew and cargo. The FLUME Product Video demonstrates to what extend a FLUME Stabilization System can contribute to reduce roll motions of sea going vessels. FLUME Stabilization Systems are installed on many different types of vessels e.g. Offshore Vessels, RO-RO Ferries, Naval Vessels and Containerships. A FLUME Stabilization System is a passive free surface open channel type roll damping tank. It is partially filled with water and extends across the full beam of a ship. The tank is designed to create a stabilizing moment which counteracts the wave moment causing the ship's roll motions. It has the unique ability to adapt to changes in load and operation condition. By a change in the liquid level, the natural response period of the tank is adjusted to correspond to the roll period of the ship. The FLUME Product Video compares the impact of sea motions on a ship without a stabilization system and a ship with a FLUME installation. For further information you can check our publications in the download area or contact us at info@hoppe-marine.com.